This beautiful collection includes a mix of pink, red, white, yellow and peach bush roses that will transform your displays into a picture-perfect cottage garden. Each flower will produce an incredible scent that will fill your whole garden with a beautiful floral fragrance. These roses are repeat-flowerers meaning they'll produce masses of blooms in repeat displays from May – October every year. All disease resistant and winter hardy, these varieties have been specially picked and brought together because of their proven performance in British gardens. Supplied as a set of 5 bare root plants, they'll grow to approx. 60-90cm high – the perfect choice for beds, borders and patio pots alike. This sensational Garden Glamour collection has been specially selected and features five multiple award-winning varieties, three of which have been honoured with the prestigious title “World’s Favourite Rose”; 'Pascali', 'Queen Elizabeth' and 'Peace'. All are proven performers, guaranteed to produce masses of fragrant classic-style flowers. Each bush repeat flowers from May to October for a non-stop display of spectacular colour and scent – plant now for the best flowering displays next year. Perfect for pots, patios or borders, they reach 60 – 90cm in height and spread – perfect for all gardens, and easy to keep too. 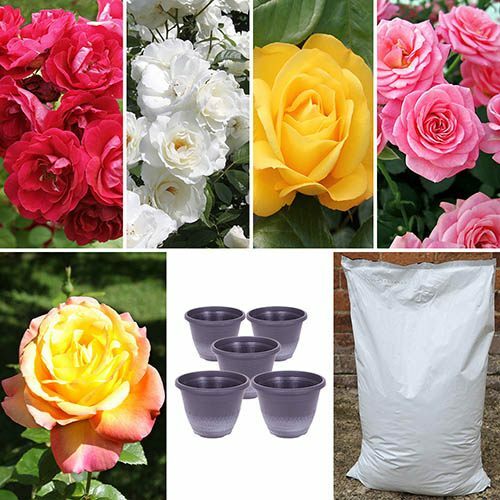 Good disease resistance makes this collection ideal for you if you're new to rose growing or haven’t got the time to worry about maintenance - they're ideally suited to British gardens. Add plenty of well-rotted manure into the hole and plant so that the graft union (the swollen are when the stems meet the roots) is just below soil level. Water well every other day - daily if the weather is hot and dry.Established roses can be watered around once a week through spring and summer - more if the weather is hot. For best results, feed roses in in late-March/April and again late July.To prune, just remove any dead, dying, damaged and diseased stems.